Not a big poster in The Gallery but over the festive period, with some time off work, I decided to get to know Adobe After Effects. 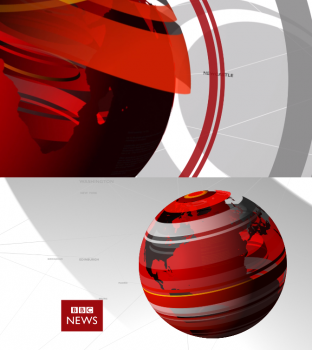 I always felt it was a shame BBC News didn't give their title sequences more of a refresh with the move to Broadcasting House, even if they kept within the same style. I thought this might be a good way to learn how to use After Effects by having a go myself. Perhaps these could be titles to launch this year ahead of the General Election? I would envisage scrapping the trundle cam (at least for the TOTH), which I always felt was over-the-top and unnecessary. Whilst I know I'll probably never live up to some of the BBC News mocks seen here recently - I'm looking at you mdtauk, KT4YU and Bail- I'm quite happy with this considering a week ago I didn't have a clue how to start with After Effects. But I'd like to do more - any suggestions on how this can be improved would be very welcome, including any After Effects tips which might also help make this video better! Not a fan of the globe. Its transparency? Its busyness? Its lack of detail so far? The globe is a bit busy, and I'm not a fan of the yellow and black. But considering you've just started using AE, this is brilliant. I managed to get myself a copy of After Effects CS4 but I haven't a clue how to get started. Any tips you can give on pulling off something like this? I'm going to tone down the globe on the end shot. The original version I had was quite empty but now I've gone too far! With the yellow, I wanted to try and give it a bit more colour than just red and white. Maybe orange would be better? I'd suggest using a lot of 'How to' YouTube videos. I just started with a simple rotating globe and went from there. I've used Premiere Pro and Photoshop briefly too so some tools are similar which helps. AE alone is not a good 3D tool, but you've done well given the tools available! It's a good start and you should keep working on it. I'm not too crazy about the yellow and red though. Looks a little busy in a few spots. I wanted to put some sort of texture (maybe a grid) on the globe itself, but couldn't figure out how to get it to appear only on the sea, with the land still transparent. Any suggestions? Adding textures to the pulses themselves shouldn't be too difficult. Sorry - not quite sure what you mean? Do you mean to make the globe stand out a bit more? To get any decent quality out of AE alone (I may be wrong here) - you will want to make your spheres larger in resolution than your composition - so when you start playing with radius/scale it doesn't get jagged around the edges. For a first attempt, this is excellent. Like others, I'm not a fan of the globe though- it's a bit too red.